Neutral To Shorting View. The Seemingly Trend Line BO Is Not Convincing. Trend Line = Inner And Minor. And The BO Sort Of Murky. I Doubt A Sudden Trend Change To Long Term Longs Until Further Data. A Bit Of Confusion = I'm Sitting On My Hands For Now. Looking To Buy Next Pullback Unto Zone, With An Ultimate Target At 1.6 =Measure Move (MM) Until Then....Sitting Hands. 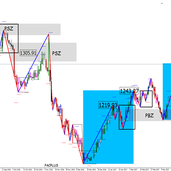 If Right Signal Provided, Over 500pips To Be Made = No Rush! Last visit •Right here, Eh!